It seems churlish to criticise Six. I mean, what’s not to like? 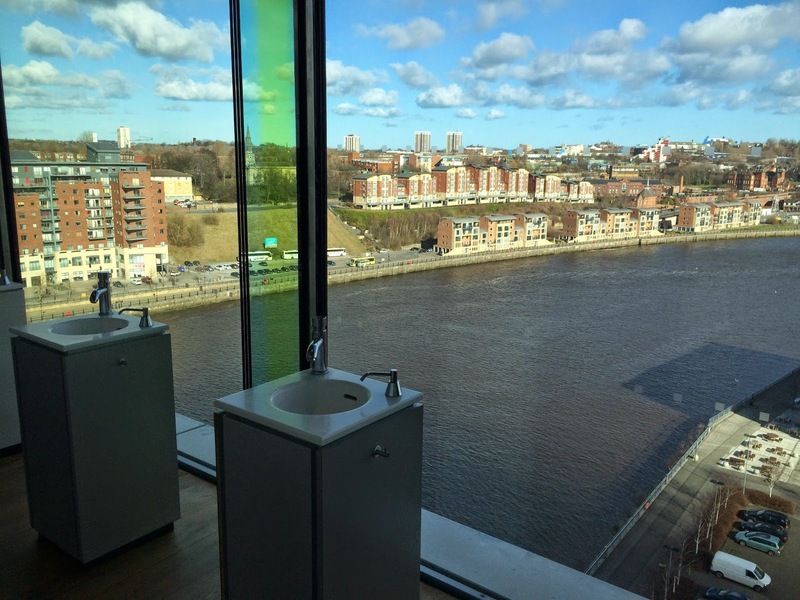 It’s a great space, with the ultimate panoramic view of the Tyne. For the past six years every food review has raved about the vista from Six’s toilets. Especially the ladies’, apparently. Six years? That achievement alone must command a standing ovation, for it’s no mean feat for a restaurant to survive the entire recession without having a natural footfall. They must cajole their customers across the Millennium Bridge and into the Baltic’s glass-walled elevator. Fresh Element, the self-styled “hospitality operators” that run it, are a North East catering success story. The atmosphere they’ve created is always relaxed, the service organised, friendly. How could I possibly criticise it? In fact I could write this review two ways. It would take just a couple of sentences to report that on this, my third visit, Mrs Diner and I enjoyed our meal. We did. So I’ve renewed the four stars I previously gave it in 2011. The cooking was fine: reliable, safe, modern European bistro fare, competently prepared, elegantly presented. But there’s the rub. Reliable. Safe. That about sums it up. Should I be concerned that the food on the sixth floor has no connection with the vision in the other floors of the Baltic? The exhibitions in the big spaces below try, albeit with varying degrees of success, to be challenging, provocative, surprising. By contrast, the food at Six is conceptually lightweight. Maybe it doesn’t matter. I’m sure they organise the catering for the private events in the building as competently as they do their corn fed chicken with spätzle, their pickled beetroot salad and their apple and berry crumble on the good value lunch and early evening menu (£18.50 for three courses). But I have always felt, and this meal did nothing to persuade me otherwise, that Six is a bit of a wasted opportunity. 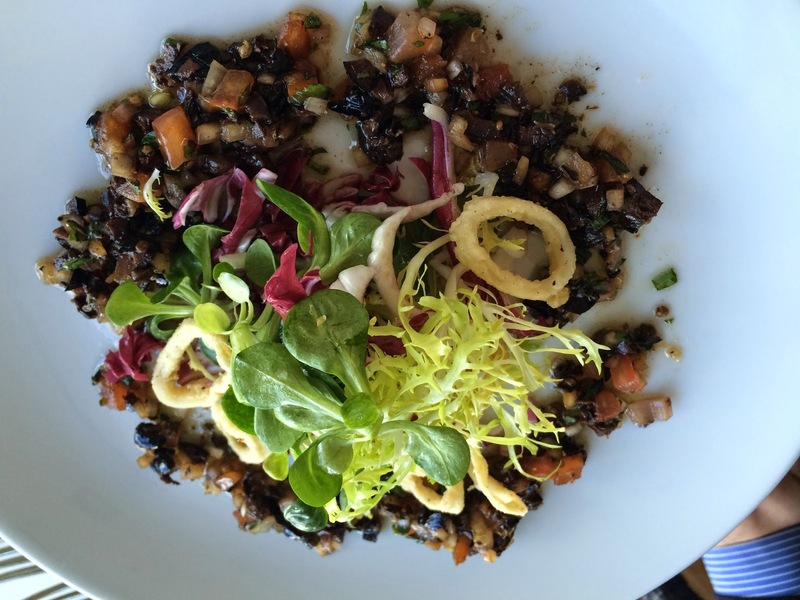 Restaurant menus, like art galleries, change their offerings seasonally. They are planned well ahead. Surely, with a little imagination and collaboration, there could be a correlation between the two? Six offers food that you could taste in any public building, and a thousand bistros, anywhere in the land. Distinctive it ain’t. Yet this place is, by definition, a destination restaurant, so it’s a shame the food at the end of the six floor journey to the top of the world isn’t just a little more inspiring. 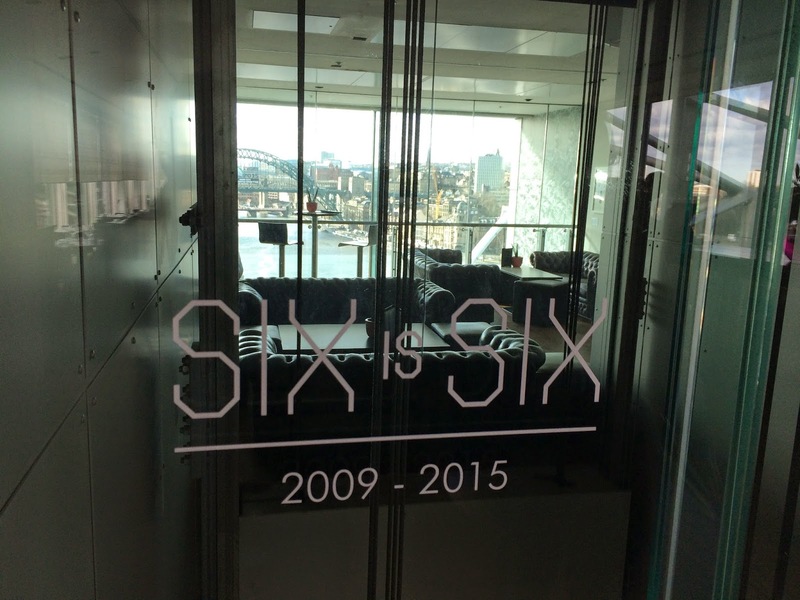 As a result, Six’s food is invariably upstaged by the view, if not always by the artworks down below. 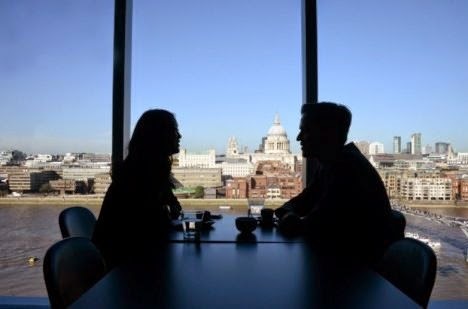 At the Tate Modern in London, there’s also a sixth floor restaurant, with a great panorama of St Paul’s and the City of London. The Tate’s menu proclaims a similar vision to Six’s: “high quality seasonal produce”. And not much more. Aside from the fact that it has some of the rudest and most chaotic service in London, The Tate has similarly safe cooking. No one would think of going to the Tate for lunch without visiting the galleries. It survives on the hunger pangs of thousands of visitors. That’s why I’m surprised, and even impressed, how, despite having almost no footfall at all other than confused schoolchildren on school trips, Six has managed to entice so many diners into its glass elevators. I just wish the destination offered a little more creativity, and perhaps some connection to the rest of the building. In one room was an exhibition by a young artist called Jesse Wine. 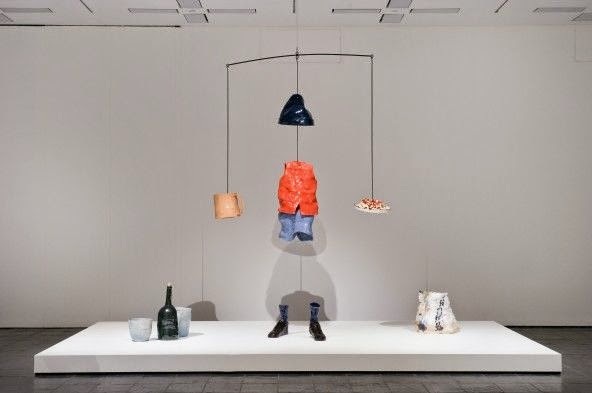 He had brightly coloured ceramic puppet parts floating on bits of wire – a hat, a jacket, a cup, some shoes. It was a homage to Alexander Calder, the first creator of the mobile, a pioneer of kinetic art. It was also jolly and fun. Meanwhile Mrs Diner had carrot and caraway soup. Mild and subtle, I wrote on my notepad. Too mild, and diluted further by a dollop of yoghurt. There was a sprig of coriander on top. Reliable, you see. Neither jolly nor fun. My salt and pepper squid came with “sauce vierge” that had been reconstructed into a mound of olives, tomatoes and other vierge ingredients. On this were scattered shavings of squid: thin, mean rings so tiny and mean, they acted as mere decoration, rather than the main event. Yet Jason Rhoades’ work in another gallery is witty, aggressive, detailed. I like witty, aggressive food. This was squid and olives. 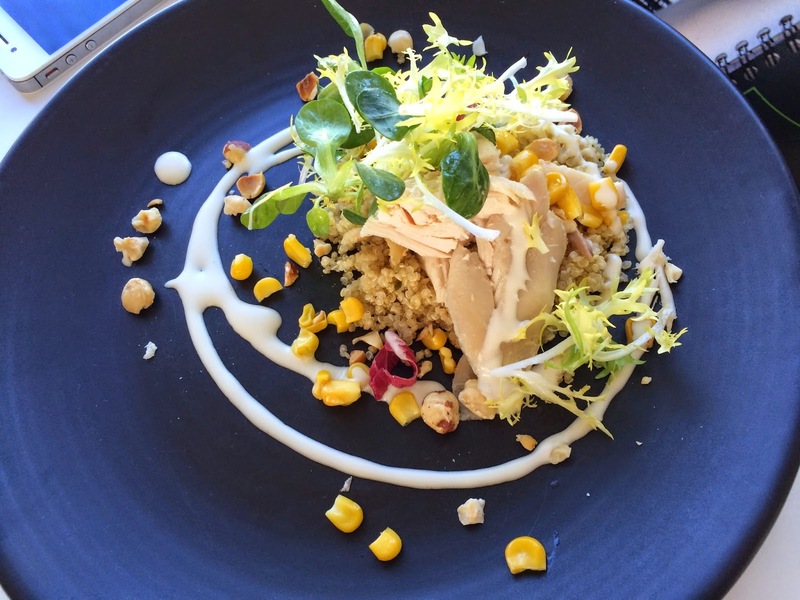 We tried a third starter for fun: smoked chicken and quinoa salad, prettily displayed with a swirl of dressing and a few scattered unroasted hazelnuts and bits of sweetcorn. It would work well as a starter at a summer wedding. But then, Fresh Element is a “hospitality operator”. I imagine they do great weddings. 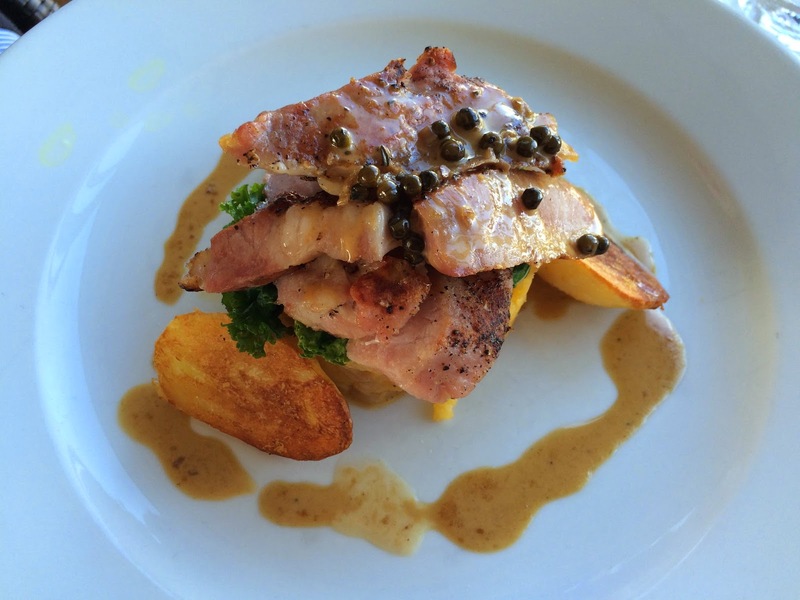 My bacon chop was salty, and should have read bacon chopped, for it was chunks of ham, on a mash of carrot and swede, a sauté potato or two, and a peppercorn sauce. Mrs Diner’s main course of bream fillet was more of a work of art, which shows they can do it if they try: some swirly pickled carrots (which I liked, in a sharp tarragon vinegar I think), another swirl of pak choi, and foamy coconut. This was much better. 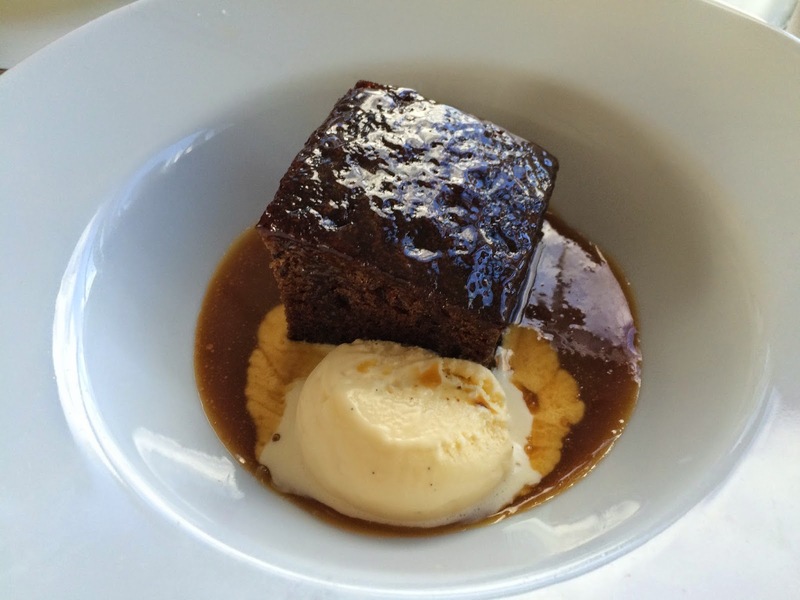 We ended with sticky toffee pudding, which was no more memorable than any other sticky toffee pudding I’ve ordered in the last six years. 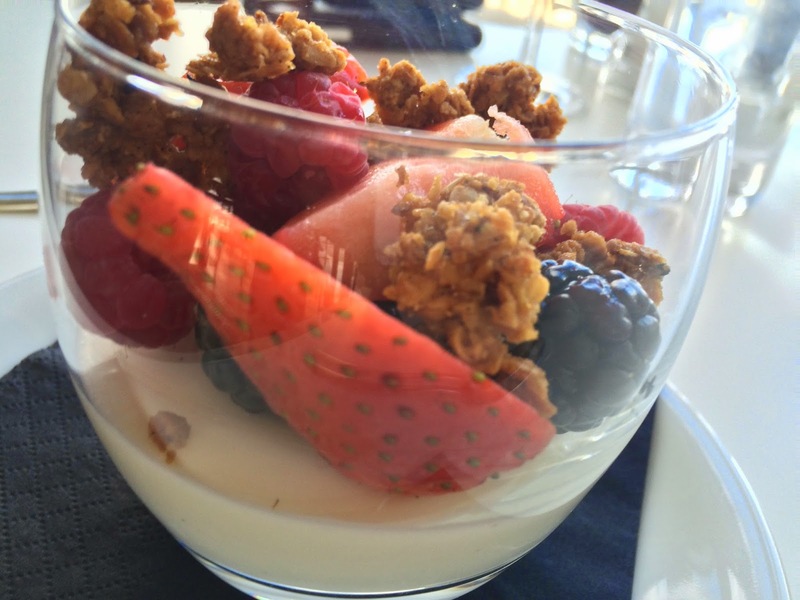 And Mrs Diner had an assembly of yoghurt and honey mousse in a glass with some granola, blackberries and raspberries. She said it was an homage to breakfast. 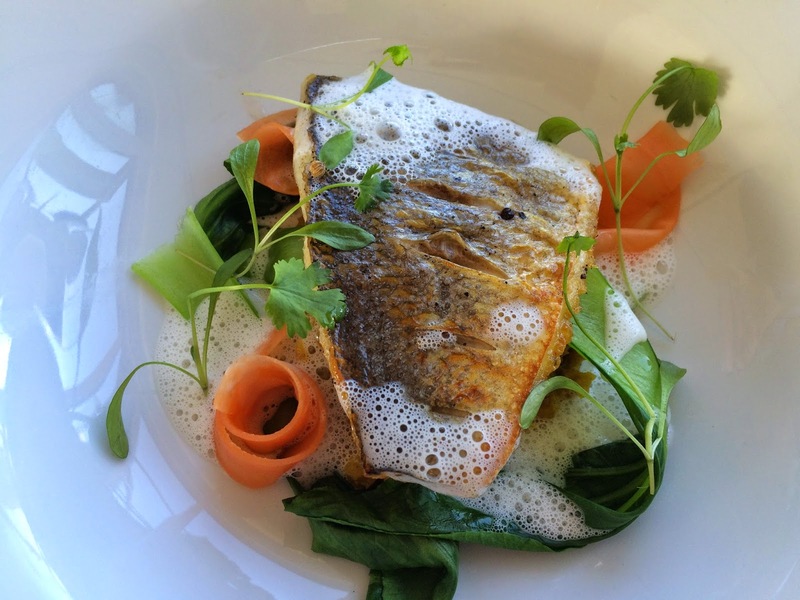 I’m not really carping: this was good value, in a nice room with a great view and very friendly service, and of course in the evening the à la carte menu shoots up your expectations in proportion to its prices (allow around £40 a head). I’m just floating the slightly heretical suggestion that, in its seventh year, Six might risk shedding a bit of reliability for some ambition, and up its game to five stars, rather than four. Couldn't agree more, cooking is safe and not reflective of the art. 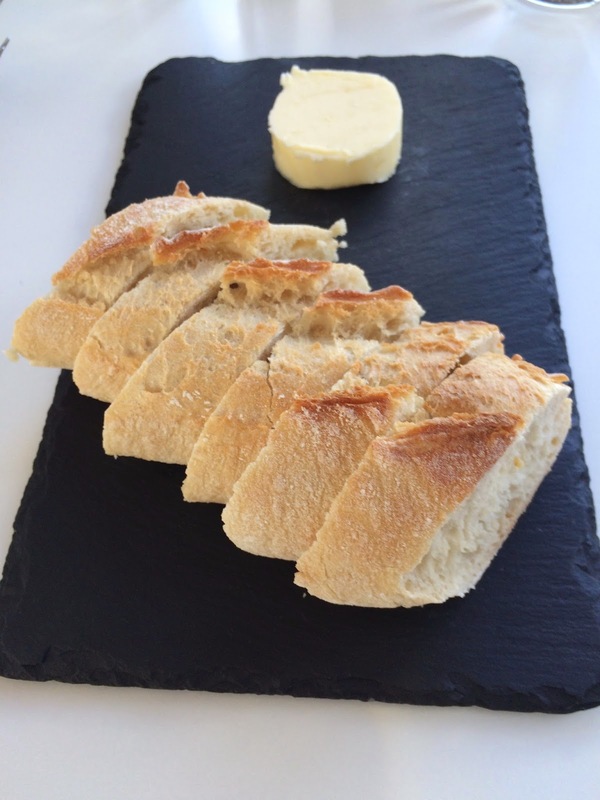 At the Guggenheim in Bilbao the marriage between food and art is superb. 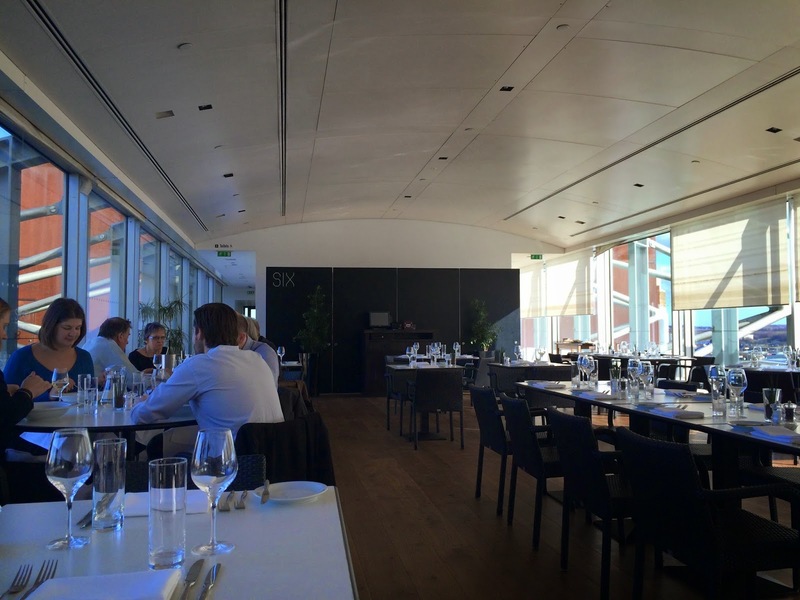 You have Josean Alija producing works of art on a plate and the bistro is superb value. 25 euros for 3 courses and a bottle of wine! 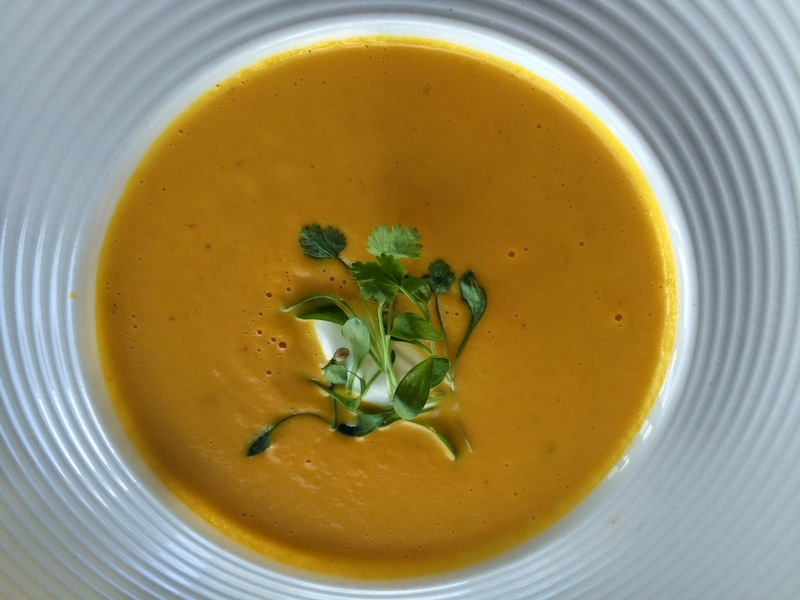 Six Restaurant should be pushing food boundaries instead of cooking carrot soup. I've eaten at Six several times and enjoyed each time. I never thought of it from the perspective that the restaurant doesn't reflect the modern art it shares a building with. It is safe and everytime i've been, it's been without a thought to art exhibitions and only about the food's decent and the views are nice. A challenging & thought-provoking review! "Yesterday evening I went with my husband to Six for an early dinner before a concert at Sage Gateshead. We have been to Six twice previously last year and found their daily specials menu to be excellent value. Imagine our disappointment last night - no specials and no a la carte either! Just one menu, 2 courses for £29.95 or 3 for £34.95. I have no idea what happens if you just want one course! We were told that the new menu had just been introduced on the previous day and it seemed to show in both the cooking and presentation. mussels and clams, potted shrimp butter, samphire and gnocchi. As if to make up for the teeny starter we were presented with two huge mackerel fillets. One would have been ample. We love mackerel but no way could we finish these fillets. There were shrimps on the plate but they were not potted and there was no butter with them unless it had melted. Not sure about the gnocchi. They looked a bit like sliced potato. With 2 medium glasses of white wine and 2 espressos the bill came to £77. What restaurant in its right mind introduces a new pricing system like this at the quietest time of year? We had gone expecting a decent meal with a glass of wine and coffee for around £45 as on previous occasions. We wont be going back!